Located on one of Gardiner's most beautiful country roads you will find this very magical property with a light filled, renovated one-story home. A crystal clear swimming and skating pond was created with a patio and fire-pit nearby providing year round enjoyment. Thoughtful and beautiful landscaping considers privacy and offers lovely vistas from all rooms in the house. 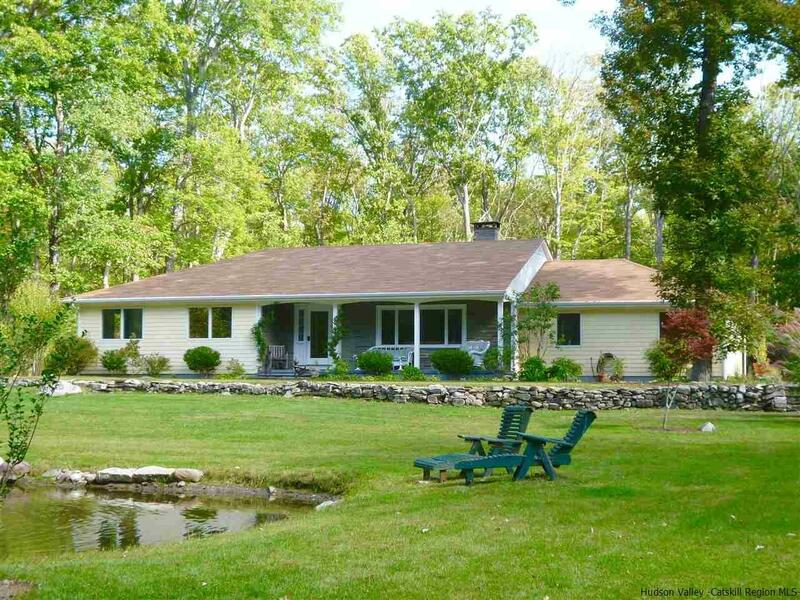 Enjoy Shawangunk cliff views from several areas on the property, which is 9.5 acres of level land - open and sunny around the house and pond and then wooded with trails toward the back of the property. There is plenty of room for a pool, tennis court or horses if you'd like. This homeowner (only the 2nd one ever) has lovingly updated just about everything in the house including the kitchen and all appliances, created a spa like master bath, updated the guest bath, built outdoor patios, a deck and an outdoor shower. More living space was added in 2016 when the garage was converted to a 12x22 family room plus an office, laundry room with half bath, and utility/gym area. A full list of improvements and mechanical updates is available. This home offers a comfortable, easy lifestyle - all on one level, updated and economical to maintain, with a feeling of "good energy" inside and out. In addition, there is an adorable 14x22 studio building set up now as guest space which could be used as an artist or writers studio, office or yoga space. So close to climbing, hiking, skydiving, kayaking, rail trail for bicycling, Mohonk Preserve, Lake Minnewaska, the villages of Gardiner and New Paltz. Wineries, orchards and farm stands are plentiful. A great weekend or full time home and only 90 minutes to NYC.